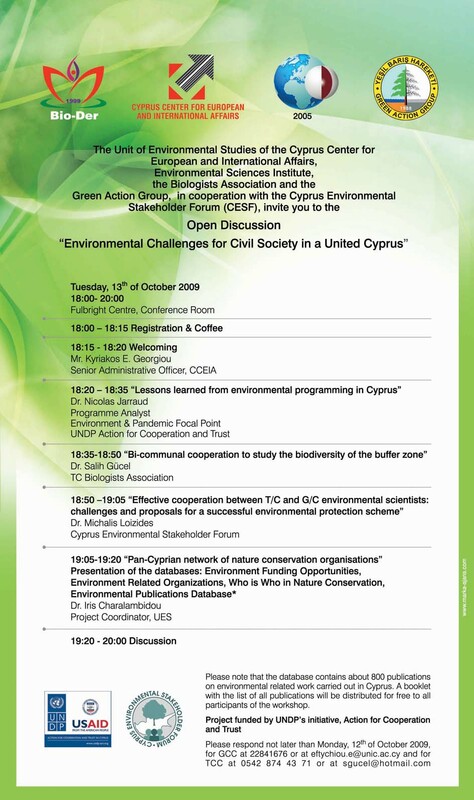 Dr Mihalis Loizides, Director of AKTI, participates as key speaker in the Open Discussion “Environmental Challenges for Civil Society in a United Cyprus”, 13 October 2009, Full Bright Centre, Nicosia. 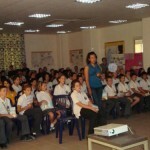 AKTI supports the 3rd Environmental Festival, organized by radio ASTRA. 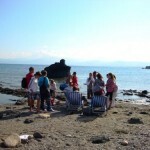 The festival will take place the 11th of October, from 3:00 to 6:00 in the afternoon at Athalassa Park – St George Aglantzia. The Forestry Department supports the event. AKTI will be there with the Mobile Information Centre and will present a home composting exhibition, will give information for energy saving homes and many other activities. Director of AKTI Mr Michael Loizides was invited and participated at the reception with civil society representatives in honour of The Elders Desmond Tutu, Jimmy Carter and Lakhdar Brahimi. The meeting was very interesting and Mr Loizides had the chance to discuss with Mr Tutu and Mr Carter on issues relevant to the Cyprus problem, the peacebuilding process and the present situation in Cyprus. 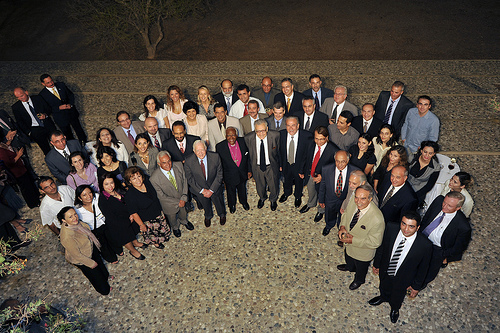 The event was organised by the United Nations Peacekeeping Force in Cyprus and the United Nations Development Programme Action for Cooperation and Trust, on Wednesday, 8 October 2008 at the Residence of UNPA, in Nicosia – Cyprus. 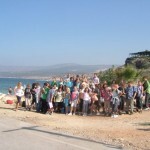 LITTORAL 2008 is a major and unique European coastal event attracting an international audience of coastal researchers, managers, practitioners and public administrations. 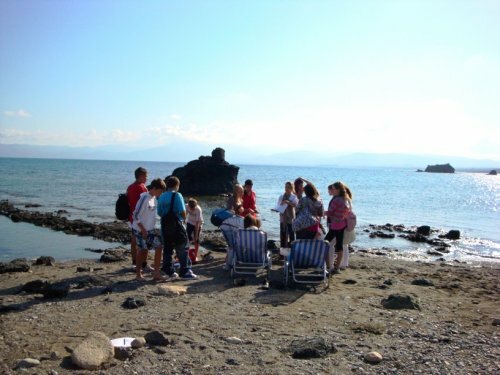 This year Littoral 2008 has a unique opportunity to build upon some recent developments in coastal management. Η ημέρα Ηνωμένων Εθνών είναι ένας διεθνής εορτασμός της επετείου της ίδρυσης των Ηνωμένων Εθνών, στις 24 Οκτωβρίου του 1945. Την άνοιξη εκείνου του έτους οι αντιπρόσωποι πενήντα εθνών συναντήθηκαν στο Σαν Φρανσίσκο για να βάλουν τις τελευταίες πινελιές στον χάρτη των Ηνωμένων Εθνών. Η ημερομηνία 24η Οκτωβρίου χαρακτηρίζει την ημέρα στην οποία λήφθηκε επίσημα ένας ικανοποιητικός αριθμός επικυρώσεων για να προωθήσει τα νέα Ηνωμένα Έθνη. Ένα νέο σφαιρικό όργανο είχε προκύψει από το χάος και την καταστροφή του δεύτερου παγκόσμιου πολέμου για διασφαλίσει την ασφάλεια των επόμενων γενεών, να επιβεβαιώσει την πίστη στα θεμελιώδη ανθρώπινα δικαιώματα και να προωθήσει την κοινωνική πρόοδο και τα καλύτερα πρότυπα της ζωής στις μεγαλύτερες ελευθερίες. Το 1947 η γενική συνέλευση των Η.Ε ενέκρινε ένα ψήφισμα δηλώνοντας ότι 24 Οκτωβρίου «επίσημα θα κηρυχθεί ως ημέρα Ηνωμένων Εθνών και θα αφιερωθεί στο να γνωστοποιήσει στους λαούς του κόσμου τους στόχους και τα επιτεύγματα των Η.Ε, και στο κέρδος της υποστήριξής τους για την εργασία των Ηνωμένων Εθνών». Η ημέρα των Η.Ε είναι τώρα χαρακτηριστική στα 189 κράτη μέλη των Η.Ε, σε όλο τον κόσμο. Ο εορτασμός της ημέρας των Ηνωμένων Εθνών προσφέρει μια ευκαιρία στο κοινό να εξοικειωθεί με τις δραστηριότητες των Η.Ε και να εξετάσει τις προκλήσεις που αντιμετωπίζουμε μαζί ως παγκόσμιες κινήσεις σε έναν νέο αιώνα. UPDATE : BRONZE METAL FOR BREASTFEEDING CYPRUS!!! The bronze metal was awarded by WABA, the World organisers, to Cyprus for the breastfeeding event organized by AKTI and Breastfeeding Support Group of Nicosia the 11th October 2008. 90 mothers with their babies, husbands, grandparents and representatives of health stakeholders participated in the World Sychronised Breastfeeding Event 2008 organized by AKTI and the Breastfeeding Support Group of Nicosia, in the Hilton Park in Nicosia on 11th October. 78 babies out of 90 breastfed at exactly 11 o’clock, while in a parallel event organized in Makarios General Hospital 11 more newborns, breastfed at the same time. These numbers are considered to be extremely important (bearing in mind the scale of Cyprus) allowing our country to receive the bronze metal by the World organizers. Cyprus says YES to breastfeeding! In the framework of these global events, the Breastfeeding Support Group of Nicosia and AKTI Project and Research Centre, organize for a second year in Cyprus a synchronized breastfeeding event which will take place on the 11th of October, 10:30 am, at Hilton Park in Nicosia. The registration of the participating mothers will begin at 9:00 am and will be concluded by 10:30 am. As we celebrated the 2008 Olympics and the 2008 World Breastfeeding Week, the World Alliance for Breastfeeding Action (WABA) calls for increased support for mothers striving to achieve the gold standard of infant feeding: to breastfeed their babies exclusively for the first six months, and continue breastfeeding together with feeding other appropriate complementary foods, up to two years and beyond. To expand awareness of the need for and the value of providing support to a breastfeeding mother. To disseminate updated information about support for breastfeeding mothers. To encourage the creation of optimal conditions for the provision of mother support in all CIRCLES OF SUPPORT. MATERNAL BREASTFEEDING, FOR HEALTHY CHILDREN, FOR A HEALTHY SOCIETY! Aside from the global aims, it is important to promote the value of maternal breastfeeding in Cyprus where very few mothers breastfeed their children. Hence the ultimate goal of the local organizers of the event is to change the attitude of the Cypriot society towards breastfeeding. Women in Cyprus should be able to breastfeed while being supported and encouraged to do so. Support a Mother to Provide a Golden Start For Her Child ! With Breastfeeding, Everyone Wins ! For more information on how to participate contact the following numbers: 22591791, 22458485 or email to akti@akti.org.cy The event is organized under the auspices of the Minister of Health Mr. Christos Patsalides. Supported by: Cyprus Paediatric Society, Cyprus Society of Perinatal Medicine, Cyprus Gynaecological Society, Cyprus Nurses and Midwives Association, Europa Donna Cyprus, Nursing Department of CUT and Cyprus Nursing Academy. 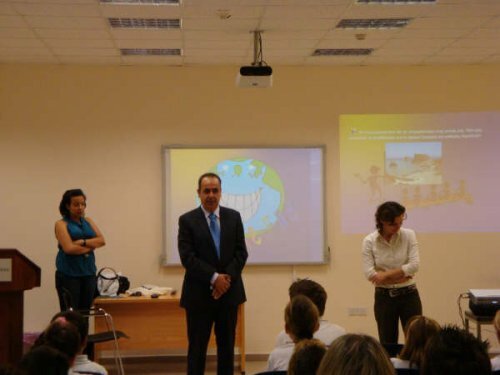 The events organized and implemented in Cyprus by AKTI Project and Research Centre for Coast Day 2008 was a great success! More than 12 Mass media have been involved (newspapers, radios and TVs), the official Coast Day video has been on TV 2times per day since 14 October (TV Magic) and 4 times during 24th (Omega TV). 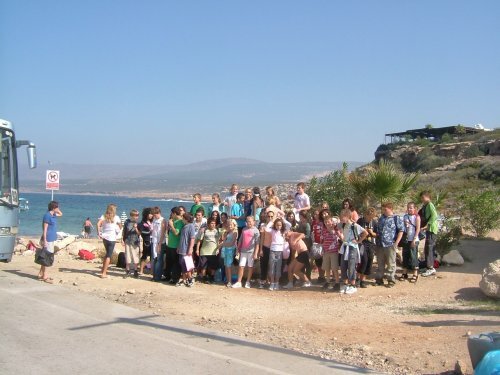 Radio interviews, articles in newspapers, beach cleanings, 2 mini workshops in schools (Primary School of Prodromos in Larnaka and International School of Pafos) with the participation of 300 children and with coverage from TVs and radios, establishment of October as coastal awareness raising month for the students of International School with the support if AKTI, meetings with stakeholders (eg the Mayor of Pafos), e-newsletters etc. 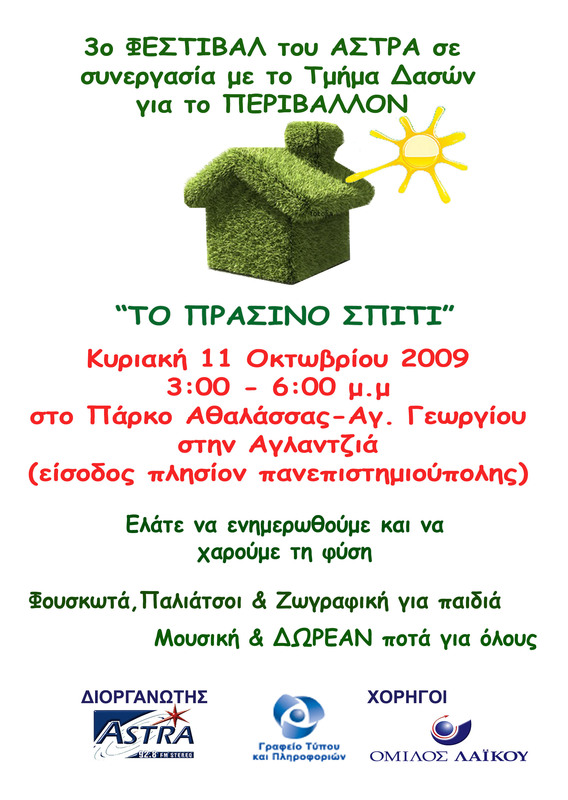 AKTI is opening its environmental library to the public! Students, teachers, scientists, and civilians are invited to access AKTI’s large collection of books and electronic archives, magazines, scientific archives, and newspaper articles. The library contains information on a variety of environmental topics, including water, energy/ alternative energy, transportation, alternative fuel sources, waste management, composting, organic agriculture, soil, bioengineering, pollution, coastal zone management and sustainable development, as well as scientific and educational volumes on chemistry, engineering, geology, natural history, and a variety of other topics. Anyone engaged in conducting research in any of these areas, studying these topics, or simply interested in learning more about environmental issues is welcome to visit AKTI headquarters on weekdays, between 9 A.M. and 5 P.M. AKTI’s library is located on the 4th floor at 1, Kalliopis St. and Larnaka Avenue, 2102 Aglantzia – Nicosia, Cyprus.